The first issue probed was whether, before I met them, the respondents had actually been aware of their family history. What was their attitude to their Irish background and heritage? Most, but not all, of the respondents were interested in their family history but only four had done much work on their family trees. In three cases other relatives had done some work. In every case I was able to add to their factual knowledge of their Irish ancestors. How did these people see their identity? The views were somewhat conflicting. When asked at the start how they saw themselves, only one of the respondents said they were significantly – or at all – Irish. Another person saw herself primarily as a Catholic and another mentioned a working class identity. All but one of the rest described themselves as ‘English’ and/or ‘Staffordian’, often with the epithet ‘born and bred’. When asked more generally about their attitude to their Irish background, the responses were more mixed. The woman mentioned in my last post who was the only one with two Irish parents expressed her Irish pride most forcefully. She commented that it was ‘nothing to be ashamed of – why reject it?’ and went on to say she was ‘proud of it even now’ since ‘Ireland was the land of saints and scholars’. Such poetic views were not to be found amongst the other, ethnically mixed, respondents. In four interviews a sort of defensive pride was expressed in their Irish roots, reflecting a clear feeling that the social environment in Britain could be hostile to the Irish. In one interview people commented that they were proud to be one quarter Irish, but that ‘people can be derogatory’ about it. At the other extreme, in six interviews the people had never seen an Irish background as being significant in their lives, either in their upbringing or now. ‘Interesting, but so what – it’s nothing to do with me’ was one comment. There was, nevertheless, a hint in two cases that these attitudes came from people wanting to distance themselves from relatives who conformed to crude stereotypes of Irishness – drink, gambling and so on. In one case the people claimed they hadn’t known about their Irish heritage when young but had developed an increasing awareness of it in later life, partly because of the Troubles. Having an Irish surname name had led to hostile comments at work in the aftermath of the Birmingham pub bombings (1975). This fading had been occurring down the generations, and it was worth probing peoples’ knowledge of how their ancestors saw their identity. What was their attitude to their Irish backgrounds, and did their ancestors retain any obvious Irish connections? Only one group of respondents could remember any surviving Irish-born in their families and this was because the family emigrated in the later nineteenth century. In all the other cases time had broken the link with the Famine emigrants and their mid-century successors. It is unfortunate that oral history was not carried out with such people in the earlier twentieth century. A person in one interview had been born the same year (1921) as two key Irish-born family members had died. His comment on one of these people – ‘as Irish as they came – a full-blown Irishman’ – implied a real personal memory, and it illustrates the need to check the veracity of statements against the hard evidence. In this case, he was actually reporting family memories that were current in his childhood. Although direct knowledge of the immigrant generation was generally lacking, in all but two of the interviews the respondents had known some second generation people born in England in the second half of the nineteenth century. The picture in relation to these people was mixed. The strongest expression of Irish identity was in the lady born in Stafford in 1917 of Irish immigrant parents. She said that ‘it was drilled us into by our father that we were Irish Catholics’. …. ‘Neither of my parents forgot their Irish roots’. The respondent’s father had sung Irish rebel songs, although her mother’s response to this was ‘shurrup, Mick, you’ll get us all hung’. [v] This family had migrated from Blackburn to Stafford in 1915, and their strong Irish identity may have reflected the stronger Irish environment in densely settled Lancashire as compared with Stafford. The two families discussed above showed the clearest signs of the survival of Irish identity and perhaps patterns of behaviour into succeeding generations, but the late arrival of these families in Stafford to some extent set them apart from the other families in the interviews. The longer time scale since immigration in the others inevitably tended to produce more ‘ethnic fade’ from a twenty-first century vantage point but, even allowing for this, there is also evidence that in most other families there was greater rejection or obscuring of their Irish origins. Respondents in five interviews suggested that some of their ancestors or people in other branches of their families had done this partly in pursuit of respectability within the local Stafford community. Other peoples’ inability to point to known evidence of Irish identity amongst ancestors is its own commentary. It seems to have waned quite quickly amongst most of the Stafford Irish. Overall the lack of historical knowledge and legend in the families, as well as the general shift away from Irishness in the second and third generations, suggests a fundamental discontinuity imposed by migration to England or its aftermath. This raises the question of what produced such a result. One way in which Irishness is commonly held to have faded or been ‘denationalised’ was through its change to an English Catholic identity. [vii] Many of the Stafford Irish families did indeed show evidence that in the second and third generation Irish identity was largely converted into a Catholic identity, in some cases very staunch, in others rather nominal. In one case this identity had clearly been contested and ultimately displaced by class identity through their ancestors’ involvement in trade unionism and Labour politics. To look at this in more detail we need to look at peoples’ experiences. In eleven out of the thirteen interviews the respondents had been brought up in Stafford, and in ten cases they have lived most or all of their lives there. What did they think were the most influential factors in their upbringing? The answer was very clear. Although parental influence was mentioned, the impact of schooling and the Church was paramount. Twelve of the twenty-one respondents had been to one or other of the three Catholic schools in Stafford, and half had been to St Patrick’s in the town’s traditionally poorer north end. [viii] These people emphasised the importance of the schools, churches and their linked social activities – youth clubs, scouts/guides, soirées – in their lives when they were young. They were also clear that Irish issues were almost totally marginalised, particularly at school. They normally celebrated St Patrick’s Day, but no other side of Irish culture, history or current affairs was ever raised at school or church. The school was, however, strong on saluting the (British) flag and other symbols of British nationalism. To what extent was the creation of this ‘Catholic community’ a reaction to anti-Irish or anti-Catholic hostility? This issue was probed through peoples’ own experiences and views of the extent of anti-Irishness and anti-Catholicism in Stafford. All but one of the interviewees had lived through the period of renewed Irish immigration during and after the Second World War. None of them argued there had been strong and widespread anti-Irishness or anti-Catholicism in Stafford, though some cited individual incidents. They found it difficult to distinguish between incidents of anti-Irishness and anti-Catholicism, but two people were clear they had experienced anti-Catholicism rather than anti-Irishness. The fact that they had Stafford accents they felt removed any threat of the latter. The oldest person did, however, express strong, though rather contradictory views. She said that ‘people used to call the Irish everything – but not me. People could be hostile to the Irish in Stafford – they thought you were below them.’[xi] She said that Staffordians ‘resented the Irish’ in the generation that grew up in the 1920s and 1930s, but her niece, born in 1940, claimed not have experienced such reactions during her life. This lady grew up, however, with a local surname and a local accent, both of which would have shielded her. Thirteen of the respondents had grown up with an ‘Irish’ surname and four referred to problems they had experienced with that. The nine others claimed to have had no difficulties. In day-to-day life these people and their immediate ancestors were indistinguishable from totally ‘English’ native Staffordians. Their general view was that Stafford was a tolerant town, but in one case it was described as ‘cliquey’. This was linked to class attitudes – that the middle and upper classes tended to belittle poorer working class people. The majority of respondents who still lived in Stafford were nevertheless generally positive about their experience of the town and they emphasised that in the past it was a community and that ‘everyone knew everyone’. One person emphasised the social significance of Roman Catholics amongst the town’s professional and commercial classes. The Church had made, therefore, strong and partially successful efforts to build a Catholic community in Stafford. One reason was that the Church’s strength was undermined even in the second half of the nineteenth century by wider social interaction, intermarriage and ‘leakage’. All my Stafford Irish interviewees were descended from Catholic families, but there was a complex picture of the strength of Catholicism amongst both them and their ancestors. Six of the families had retained Catholicism in the generations from the late nineteenth century to the 1940s, though in two cases adherence became nominal on the male side. Respondents from five of these families remained active Catholics in the early 2000s. In six cases interviewees came from earlier mixed marriage families and the Church’s historic concern about ‘leakage’ was borne out by these families’ behaviour. In four cases the Catholic partner’s adherence to the Church had weakened and none of the people descended from these marriages was still Catholic. One interview was interesting because the parents in a mixed marriage had ‘split’ their children. One interviewee was brought up as a Catholic (and had retained his Catholicism) whereas the other was not and had no connection with the Church. In total, seven of the respondents remained active Catholics, but they were a minority of those interviewed. Eight respondents were never Catholics and six had lapsed from the Church. In one case people had rejected the Church when they were young because of bad experiences at St Austin’s Catholic School. They felt they were picked on because they were the poor children of a religiously-mixed marriage. Their parents took them away from the school and the male child had also joined the Boys’ Brigade connected to the Baptist Church because it was more welcoming than St Austin’s. The evidence from these interviews suggests, therefore, that the Catholic Church and schools were a force for ‘denationalising’ the descendants of the Irish immigrants but that the immigrants themselves and their children also actively buried their Irish heritage. In the long term a majority of the descendants also lost or rejected their Catholic heritage. Stafford’s nineteenth century Irish population and its descendants were a numerically small population that was distributed throughout the working and middle class areas of the town. It increasingly intermarried with the local population. By 1884 a majority of Catholic marriages in Stafford involving an Irish-descended person were ethnically mixed and by the 1900’s the proportion was over ninety per cent. [xii] This basic fact was reflected in the families of the people I interviewed in the early 2000s. But it must also apply to the majority of descendants of the immigrants from Ireland who came to Britain in the nineteenth century. These people do not form some relict Irish ‘community’ but are a complex ethnic intermixture of people descended from that period. The evidence from the interviews reflects these circumstances. There has been massive attrition of evidence about their past amongst the descendants of the Irish in Britain. Ethnic dilution, fear of British attitudes and ‘denationalisation’ are three reasons for this but first and second generation immigrants also possibly wanted to make a clean break with their Irish past. Their response to the Famine and the trauma of emigration may have been to blank it out of the family record. This is a finding that contrasts with the common belief that these events left an indelible stain on both individual and collective memory and identity. As ever, more research is needed in other areas amongst other Irish-descended families to explore the truth of this. [i] This post is a revised and updated extract from John Herson, ‘Family history and memory in Irish immigrant families’ in K. Burnell and P. Panayi (eds. ), Histories and Memories: Migrants and their History in Britain, (London, Tauris Academic Studies, 2006) pp. 210-33. [ii] Reviewed in R. Swift, ‘Identifying the Irish in Victorian Britain: Recent trends in historiography’, Immigrants and Minorities, Vol. 27, Nos. 2/3, July/November 2009, pp. 134-51. [iii] A. O’Day, ‘A conundrum of Irish diasporic identity: mutative ethnicity’, Immigrants and Minorities, Vol. 27, Nos. 2/3, July/November 2009, pp. 317-39. [iv] The late Peter Godwin, interviewed in 2002. [v] The late Kathleen Cochlin née Crosson, interviewed in 2003. [vi] The late Daniel Ryan and Patrick Ryan, interviewed in 2003. [viii] St Patrick’s school had been founded in 1868 and was linked to St Patrick’s Church which was established as a separate mission in 1893. St Austin’s school was founded in 1818 linked to its eponymous Catholic church founded in 1791. One person had been to the Convent run by the Sisters of St Joseph of Cluny who set up in Stafford in 1903. [ix] M.W. Greenslade, St Austin’s, Stafford, 1791-1991, (Birmingham, Archdiocese of Birmingham Historical Commission, 1991), pp. 3-9. [x] John Herson, ‘The Irish, the English & the Catholic Church in Stafford, 1791-1923’, Midland Catholic History, 14 (2007), pp. 23-46. [xi] The late Kathleen Cochlin née Crosson, interviewed in 2003. [xii] John Herson, ‘Migration, “community” or integration? Irish families in Victorian Stafford’, in R. Swift and S. Gilley (eds. ), The Irish in Victorian Britain: the local dimension, (Dublin, Four Courts Press, 1999), p. 173. In my last post (26 October 2015) we traced the origins of the Larkin/Mullarkey family from Ireland through Preston to James and Anne Larkin’s household in Stafford. This post follows the family’s history to its effective demise Stafford in 1908. The Larkins were a family with problems and tensions which must have reflected, in part, identity issues arising from their migrant past. In 1886 James and Anne’s son James, who was twelve at the time, stole a cash box containing papers from St Austin’s church. He thought there was money in it. His father said in court that he was ‘a bad boy’ and Canon Acton put the boot in by describing him as ‘incorrigible’, reporting that he had been turned out of school for corrupting others. James was detained for one month and then sent to a reformatory for five years. 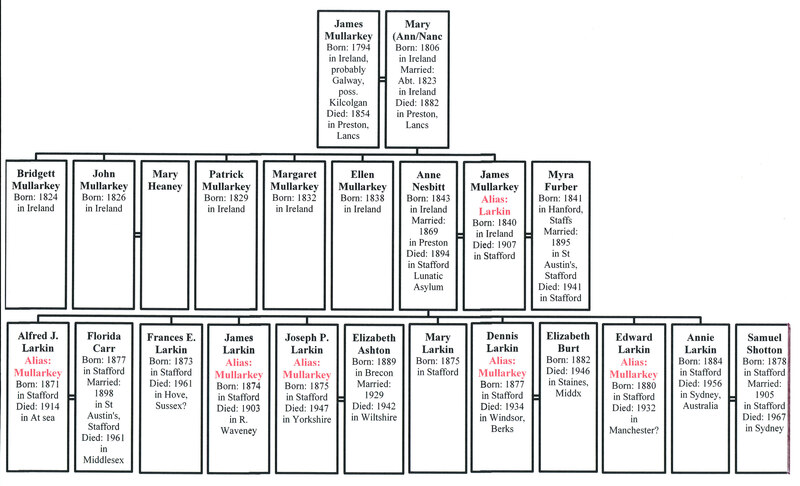 James’s case opens up the issue of the family surname – Larkin or Mullarkey? After his time in the reformatory he came back to Stafford and his father got him a job on the railway as an engine cleaner. He did not stick at it and some time before 1898 joined the navy. By 1903 he was a leading first class petty officer on HMS Hearty, but his life was cut short that year. With two others he hired a sailing boat on the River Waveney in Norfolk, but it capsized and James was drowned. Most significantly, his death was recorded as being that of James Mullarkey. He had reverted to the old family name. The funeral took place in Lowestoft and was attended by his father and his brother Joseph, and the newspaper report also referred to his father and brother by the name Mullarkey. Like James, the other Larkin children all left Stafford as soon as they were old enough to do so. Some of them, though not all, also reverted to the name Mullarkey. Why? One reason was conflict with the father over his apparent rejection of his family heritage and his choice of a new life in Stafford. Another factor was probably more mundane – the job market. Stafford’s economy was relatively depressed during the 1880s and 1890s. Many children growing up at that time realised they would do better if they left Stafford and the Larkin children saw things that way. There was, however, another family factor that led them to leave. Anne Larkin née Nesbitt died in the County Lunatic Asylum in 1894 of ‘cerebro-spinal disease’ or vascular dementia and late-onset diabetes. She was only fifty-one years old. The deterioration in Anne’s health in the preceding years must have created great stresses in the family. James Larkin was always on shift work and Anne had been the real homemaker and the centre of the children’s lives. When she became ill the older children had to take over household duties and look after their ailing mother and this was when they were impressionable adolescents. An already sad and stressful situation was worsened when, just twelve months after Anne’s death, James Larkin remarried. His new wife was Myra Furber, the fifty-three year old widow of a grocer from near Stoke on Trent. James met her through her cousin-in-law who was an engine driver at Stafford shed. When Anne died and James remarried six of the children were still living at home. By 1901 only the youngest, Annie, was still there. It is clear that the children all wanted to leave both the family home and Stafford town. When they left each of the children had to choose their preferred surname. At St Austin’s school the children had all been known as Larkin and that is how James entered them in the Census returns between 1871 and 1901. Half of the children – Frances, Mary, Edward and Annie – decided, at least initially, to retain the surname Larkin as they became adults. In day-to-day life that was probably the easier option but they faced problems if they had to present their birth certificates which showed the name Mullarkey. Even so, staying with the name Larkin suggests a lack of commitment to the family’s Mullarkey heritage. The children had been stressed by the events leading to Anne’s death and James’s remarriage. In some cases their subsequent history proved problematic. That was certainly the case with Mary Larkin. Mary retained the name Larkin and in 1898 was working as a ‘music teacher, domestic servant etc.’ in Cheshire. Her musical skills, hallmark of a respectable background, must have been learned at school or in the family house in New Garden Street. In February of that year she was arrested in Birkenhead and admitted a string of thefts, mostly of money, from houses across Cheshire. The newspaper reported that ‘the prisoner associated herself with the Catholic minister at Stockport and is said to have successfully filled the role of adventuress throughout Cheshire.’ She was sent to the Convent and Home of the Good Shepherd Reformatory in Litherland near Liverpool. What she did after that is unknown but she may have emigrated. Mary’s elder sister Frances Ellen took a more respectable path as a teacher. Using the name Larkin, she went in 1891 to the Notre Dame teacher-training college in Liverpool. That shows the Larkins were respectable enough to afford the fees or to tap some charitable source of money. We don’t know what happened to her after her course but she certainly did not return to Stafford. She too may have emigrated. We know most about the early adult years of Edward Larkin (b. 1880). His is the only case where we know why, having started out as Larkin, he ultimately changed his name back to Mullarkey. He left home as soon as he could and moved to Birmingham. He began work as a machinist in the city’s gun trade, but on 28 May1903 he joined the army – as Edward Larkin. He served in the Sherwood Foresters. By 1905 he had been sent to the garrison at Ambala in India and in 1910 he was at Peshawar near the North West Frontier, but in March 1911 he left the army and was transferred to the reserve. He went back to Birmingham. Edward Larkin changes his name. Can you see the evidence?! It was at that point that a practical problem arose over his surname. He got a job as a wagon repairer on the London and North Western Railway, but things had changed since his father had been taken on with the name Larkin in 1862. In the 1900s the company checked employees’ birth certificates and they insisted that Edward use his registered name, Mullarkey. 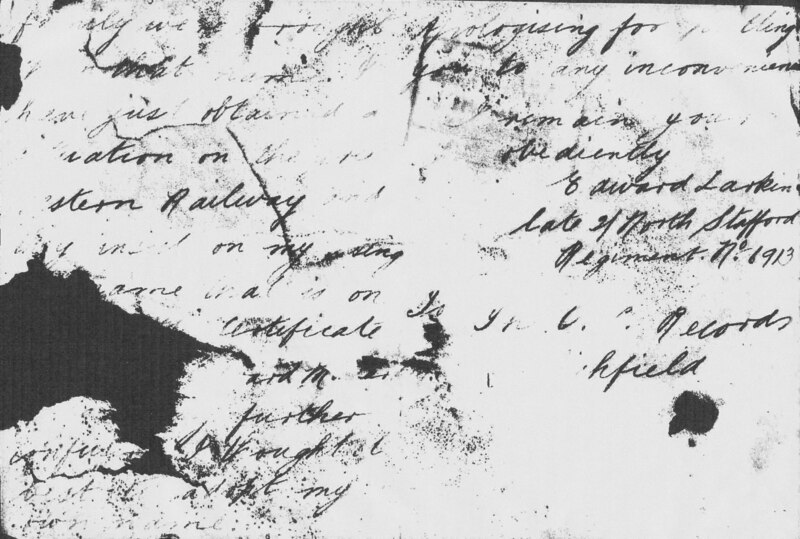 We know this because on 20 May 1911 he wrote to the army record office in Lichfield and, although now very damaged and indistinct, his respectful letter asks if ‘I could be allowed to change my name’. It explains the LNWR’s position and concludes that ‘I thought it best to adopt my own name’. The key point is that Edward obviously regarded Mullarkey as his genuine family name but made it clear that he was forced to use it now for practical reasons rather than because it was a burning identity issue for him. The change hardly turned out to be worthwhile. He soon quit the railway job and went back to the army. The bridge had been crossed, however, and he was generally known afterwards as Mullarkey, though not always. In August 1912, as Edward Mullarkey, he received a seven day sentence with hard labour for begging at Fulwood in Preston, presumably outside the army barracks there. It was a pathetic tale and suggests he had no contact with his Mullarkey relatives in Preston. He had already passed the pinnacle of his army career since he had lost his lance corporal’s stripe in 1910 for being absent from a roll call at Peshawar. He served during the Great War, though not on the Western Front, and ended his service in the garrison in Malta. He was invalided out of the army in April 1919. His subsequent history is unknown. Annie Larkin (b. 1884), the youngest child, remained with James and Myra in the family home. She was only eleven when James remarried so she had little choice but to stay with her new step-mother. As she grew up she also showed some commitment to Stafford. Events connected with St Austin’s Church seem to have been significant in her life and she attended reunions and soirées, at least once with her step-mother. Even so, she escaped home fairly quickly. In 1905 she married – as Annie Larkin – Samuel Shotton, a native Staffordian from a modest family who worked in the shoe trade. 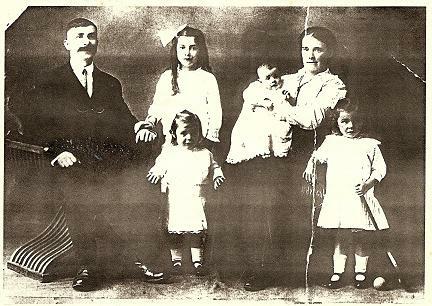 The couple had their first child, Winifred Annie, in Stafford, but in October 1908 they emigrated from Liverpool on the SS Essex bound for Sydney. The Shottons settled in that city, had six more children and created an extensive family Australia. The exodus from Stafford was completed by James and Anne’s other sons, and they all adopted the name Mullarkey. Edward and James were not the only sons to join the forces. Alfred John (b. 1871) went into the navy. Joining the military was a way for poorly qualified young men to get a guaranteed job away from their home town. It was, in other words, an easy escape route. In 1898 Alfred John married – with the name Mullarkey – a local girl, Florida Carr, daughter of an innkeeper in Littleworth. She was his only continuing link with Stafford. By 1901 the couple were living in Portsmouth and Alfred was a chief petty officer. In November 1914 he was serving on the battleship HMS Bulwark when it blew up at anchor in Sheerness. Only twelve of the crew survived and Alfred Mullarkey was one of 738 men who died. There is no evidence that Dennis (b. 1877) went into the forces but he got well away from Stafford and became a merchant seaman. In 1901 we find him – as Dennis Larkin – as a ship’s fireman living on a hulk, the SS Lady Jocelyn, laid-up in Victoria Dock, London. In 1907 he married, however, using the name Mullarkey and by 1911 was a stationary engine driver living, also under the name Mullarkey, in Forest Gate, London, with his wife and two children. So Dennis reverted to the Mullarkey name when he got married. Joseph Patrick, Mary Larkin’s twin brother, did much better than his sister and became an elementary school teacher. In 1901 was lodging in Middlesbrough under the name Mullarkey. We don’t know definitely why he reverted to the old family name but he probably needed to present his birth certificate to gain entry into the teaching profession. By 1911 was headmaster of an elementary school in West Ham. There is a family legend that he wrote speeches for the Labour Party leader Keir Hardie which, even if dubious as to detail, probably shows he identified with British labour politics rather than Irish issues. He was still single, and at that time lodging with his brother Dennis and his family in Forest Gate. That is the only example we have mutual support amongst the Larkin/Mullarkey children. Otherwise, they scattered to the four winds. The Larkin family that developed in Stafford after James’s arrival in 1862 proved to be long-term transient. The family broke up. On 4 December 1906 James was compulsorily retired from the railway on the grounds of ‘old age and ill-health’. He died just seven months later. Only Myra was then left in the family home in New Garden Street. A combination of factors had produced that outcome. Lack of job prospects during the 1890s was undoubtedly one force pushing the Larkin children out of Stafford. It seems clear, however, that their commitment to the family home and to Stafford weakened following Annie Larkin’s death. It was the mother who had acted as the prime focus of this family. James Larkin seems to have been a somewhat peripheral figure struggling to define his sense of self and his personal identity. The saga of his name change underlines this. He had shown some determination by leaving Preston, but otherwise his behaviour was irresolute. He clearly had a problem with his name but there was some force preventing him going the whole hog and abandoning his previous identity. Perhaps it was pressure, even ridicule, from his family back in Preston. Perhaps it was an unwillingness to totally abandon his family heritage – or even his Irish identity. There is no surviving testimony on why James took his decision, but he left each of his children with a dilemma that they had to resolve when they grew up. The choices made by the children split on gender lines. The daughters all stuck with the name Larkin whilst they were young adults, though we don’t know whether they changed to Mullarkey later. We do know the sons all made a clear, though in one case delayed, choice to return to the Mullarkey name. This was partly a matter of bureaucratic convenience, as Edward’s case shows, but there were also deeper factors at work. Changing back to Mullarkey inherently involved rejecting their father’s choice of name and his assumed identity. It must, in part, have been a rejection of him and his role in the family. He had publicly described his son James as ‘a bad boy’ when he got into trouble for stealing and that reveals a troubled relationship between father and son. Was this symptomatic of a wider malaise in the relationship between James and all his sons? The name issue became a weapon in a wider conflict between the sons and their father but it could also have been a conflict over the rejection or retention of an Irish identity. The sons’ ultimate choice of ‘Mullarkey’ clearly shows willing acceptance of a demonstrably ‘Irish’ surname and the family heritage it embodied, but farther than that we cannot go. Although the children were youngish adults during the struggle for Irish independence, we have no evidence that they identified politically or culturally with their Irish compatriots. The history of the Larkin/Mullarkey family in Stafford shows how the experience of even a nuclear migrant family could be complex. They had the trappings of an aspiring working class family – a secure income from a skilled job, a sound house in a respectable street and adherence to organised religion. A more detailed examination of its history illustrates, nevertheless, the stresses that stemmed from the migrant background of its founders. The ultimate expression of those tensions took over forty years to work through but they resulted in the effective demise of the Larkin/Mullarkey presence in Stafford. The 1891 Census return shows him as a ‘railway engine cleaner’; he was living with his parents. He does not appear in the LNWR staff list that records those already working on the railway in 1898. Stafford BC Burial Record 6/11938, 13 January 1894. Her age is there given as forty-nine, which is slightly younger than that suggested by the Census records. Her illnesses were inherited conditions that Annie Larkin passed on to some of her descendants. Information from John Macrae, September and November 2008. Stafford RD, Deaths, October-December 1893, 6b/11, John Furber. St Austin’s Marriage Register, 26 January 1895. 1901 Census enumeration return, Orrell and Ford, Litherland Sub-district, West Derby Registration District. Census enumeration return, 1901, which merely says ‘gun trade’, and his stated occupation on his short service attestation form, 28 May 1903. National Archives, WO363, British Army WW1 Service Records, 1914-1920, 6913, Pte. Edward Larkin, Ancestry database accessed 23 September 2013. British Army World War One Service Records, Ancestry Database: Pte. Edward Larkin, accessed 7 January 2013; reply 23 May 1911 from C. Layton, Infantry Record Office, Lichfield, to Edward Larkin’s letter of 20 May 1911. Ibid., HM Prison, Preston: particulars of the conviction of a soldier…. Edward Mullarkey. The offence appeared thereafter in his army records. British Army World War One Service Records: Pte. Edward Larkin, Ancestry Database accessed 7 January 2013. Third class steerage passenger contract ticket dated 23 September 1908, Federal-Houlder-Shire Lines, SS Essex, departing Liverpool 10 October 1908, Mr Samuel Shotton, Mrs Annie Shotton and Winifred Annie Shotton. Copy made available by John Macrae. Information from John Macrae, 2008. World War 1 – Casualty lists of the Royal Navy and Dominion Navy, 26 November 1914, Loss of Battleship Bulwark from Internal Explosion, Mullarkey, Alfred J., CPO, 139722 (Po). http://www.naval-history.net , accessed 23 September 2013. The enumeration return gives his place of birth as Liverpool, but that also applies to the man above him in the list and is almost certainly carelessness by the enumerator. Information from Mary Nobbs, July 2005. Hardie was MP for West Ham South 1892-5, well before Joseph Mullarkey’s arrival in London, but the latter may been active in the West Ham Labour Party. Staffordshire Record Office, D1225, LNWR Staff Register, Stafford, final entry in the conduct record. Stafford BC, Burial Record 9/4976, 15 July 1907.